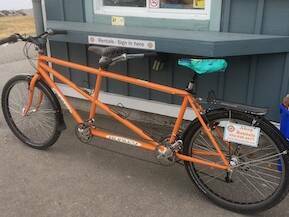 This slick looking tandem bike will get everyone looking sideways at you as you coast down the path. Explore the waterfront path in Kingston or take the free ferry ride over to Wolfe Island and explore the secluded beach. We provide maps for both routes. Baskets, locks and helmets included. Size: 19" Front, 15" Rear.